Provide comfort for the family of Simon Cheresna with a meaningful gesture of sympathy. 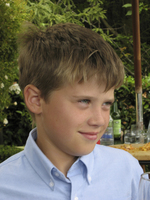 Beloved son to Mark and Deborah, cherished baby brother to Lauren (Tristan Rapp). Treasured grandson to Michael and Patricia Simpson of Scotland, as well as Sophie and the late Sam Cheresna of Ingleside. Simon was a light in the lives of his family, friends, and colleagues who are too numerous to mention. Simon will forever be in our hearts and remembered for his kindness, infectious smile, witty sense of humour, and loving disposition. 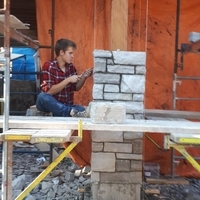 He was a talented mason who was trained in the Heritage and Traditional Masonry program at Algonquin College in Perth. That program fostered his love for historic architecture. Simon's skills were recognized when he was chosen by the College to demonstrate stone carving at Canada 150 celebrations on Canada Day in the Byward Market. Simon had an eclectic taste in music and a love of nature. He enjoyed challenging and thoughtful dialogues and always respected the views of others regardless of his own beliefs. Simon was a young man that promoted his principles by living them. His life was cut short by a momentary lapse of reason, which was a contradiction to the wisdom he attained through his continuous pursuit of knowledge and understanding. We are deeply proud of our beautiful son Simon and always will be. Donations can be made in Simon's honour to the Ottawa Riverkeeper ( https://www.ottawariverkeeper.ca/donate-simon-cheresna/ ). On Tuesday, April 2, 2019 from 5pm to 6pm. Family and Friends will be invited to share memories at 6pm. Reception to follow in the funeral home until 8pm. Donations are being accepted for: OTTAWA RIVERKEEPER INC. / GARDE-RIVIÈRE DES OUTAOUAIS INC..
We encourage you to share your most beloved memories of Simon here, so that the family and other loved ones can always see it. You can upload cherished photographs, or share your favorite stories, and can even comment on those shared by others. Mark , Laila, Bob, Mario ., Jamie-Lee Pietrantonio, and others have sent flowers to the family of Simon Alexander Cheresna. To Mark and Deborah, I would like to express my deepest sorrow and sympathies at your loss. I recall how proud you were of Simon, and how you would retell stories of him. You are in my thoughts and prayers. What I will always remember about Simon is how we would always find something to connect and bond over that made sure we weren't just cousins, but we were genuinely mates. When we were young, Simon would constantly challenge me to endless games of chess, or we would make up huge fantasy worlds with our LEGO. As we grew older we kept in contact from the other side of the world and talked about video games or music. To my disbelief, the last time we met Simon was able to join the small group of people who recommended me music that I actually enjoyed. We were family and we were mates. Rest easy Simon, you will be missed. Debbie and family, please accept our sincere condolences for the loss of your son Simon. May the memories you have of your time with Simon stay with you always. Allow those memories to bring a smile, a laugh and even a tear. This will be a sign that he is with you and watching over you. Hugs. I met Simon in grade 7 at Bridlewood and continued a friendship with him throughout the years. Simon lit up any room he was in with his fun personality and witty jokes, and I will always remember him for that. Sending my deepest condolences to Simon's family and anyone who had the pleasure to know him.